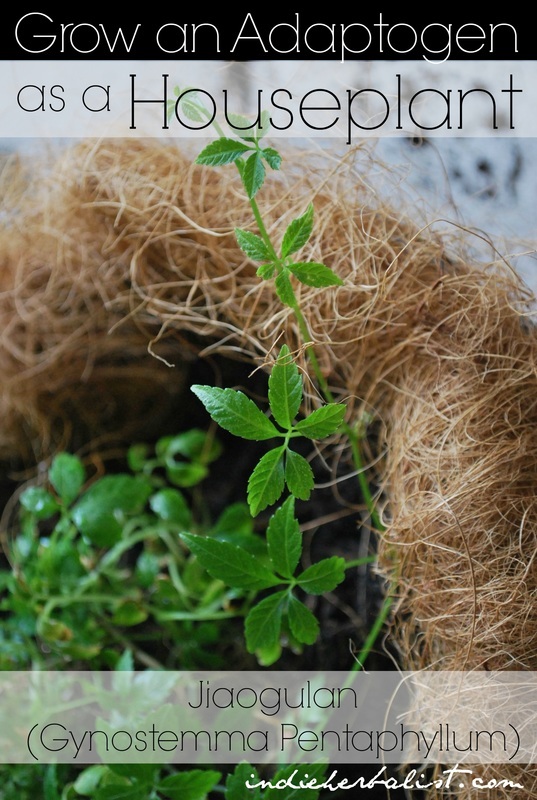 Did you know there’s an adaptogen you can grow as a houseplant? 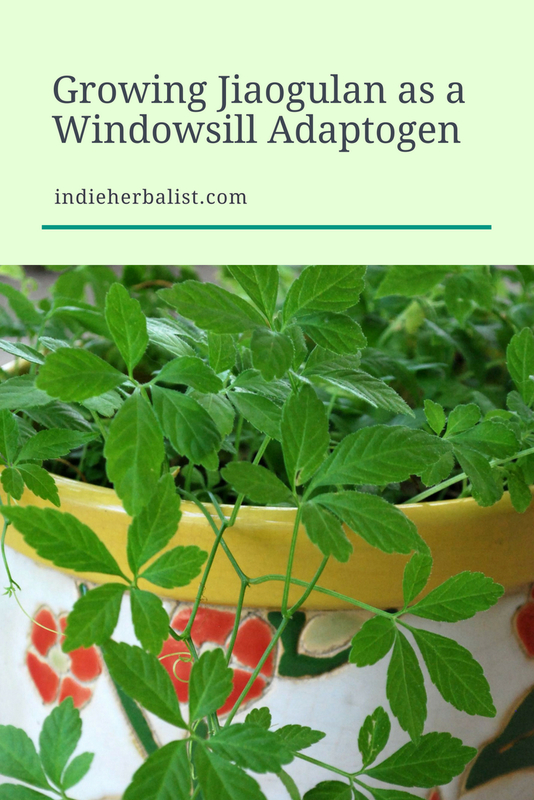 Adaptogenic herbs are a wonderful group of plants to work with for health, and they can make really nice garden and landscape plants as a bonus. I’ve been experimenting with several in my gardens. Eleuthero and he shou wu are doing very well, although I’m having trouble with codonopsis. Tulsi has become a main feature in my garden every summer and we grow it as an annual here. I have had a little trouble with my tulsi seedlings damping off if I plant before the middle of May. Otherwise, it has proved to be hardy and reliable. and jiaogulan. 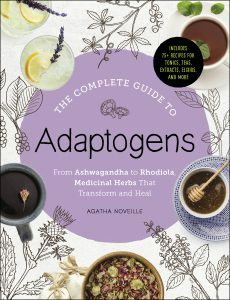 Most adaptogens will do best out in a garden setting, but even if you don’t have a garden or any outdoor space there’s one adaptogen that you can actually grow as a houseplant! That would be jiaogulan (Gynostemma pentaphyllum). 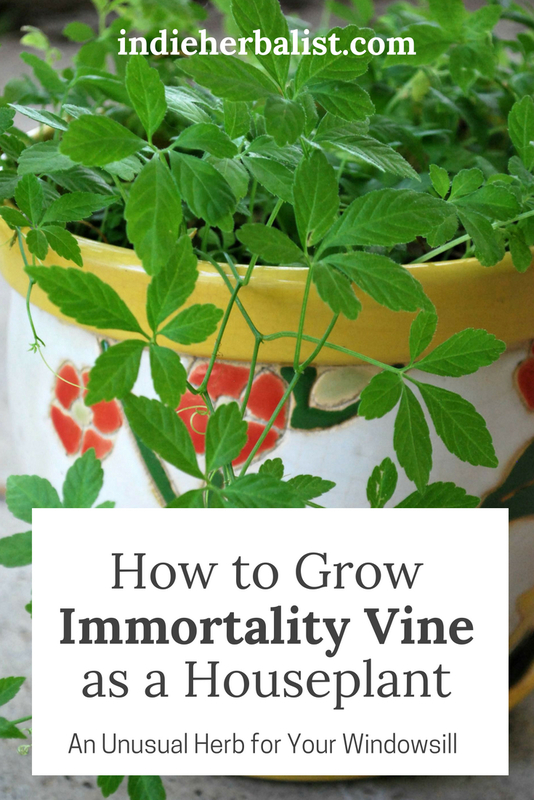 It’s a vine that can grow up to 20 feet long outdoors, but if you keep it indoors you can harvest it to keep it at a manageable size. I initially kept mine in a hanging basket on the patio, but it was difficult to keep the soil moist enough. After I switched to a deeper, ceramic pot indoors my jiaogulan has been much happier. It’s happiest indoors on my living room windowsill during summer and winter, but I sometimes set it outside in the spring. Out of all of the herbs I’ve grown, jiaogulan is the most prone to insect damage. When I’m keeping it indoors this isn’t a problem. However, any time I put it outside it is a magnet for beetles and slugs! A homemade Castile soap spray is good to help control pests on jiaogulan houseplants. If you want to grow your own, you should be able to find live plants at Strictly Medicinal Seeds and at Gurney’s. I bought mine from Strictly Medicinal Seeds as a live plant and haven’t tried growing from seed. Here are some tips for growing jiaogulan indoors that were in the seed catalog when I bought my jiaogulan. These tips are working well for me! Water every 3-5 days. Jiaogulan doesn’t like to be dry. Feed it weekly with compost tea, liquid kelp, or mycoblast. If you set it outdoors in summer make sure to keep it shaded. Trim the vines when they get too long and make some tea! The best part of keeping jiaogulan as a houseplant is using it to make tea. Whenever my plant needs a trim, I either hang the cut vines or spread them out on a coffee filter and let them dry for a day or two. Once they are completely dry, I crumble them up and store them in a glass canning jar. Jiaogulan has many of the same compounds that are found in ginseng, but it is much easier and faster to grow. It tastes good by itself, but I also like mixing it with green tea. Not bad for a houseplant! I enjoyed reading about jiaogulan as a house plant. I have this plant in my greenhouse and summer it outdoors in summer. It didn’t occur to me that it could be grown as a house plant. I began growing it three years ago and use it once in awhile in tea. 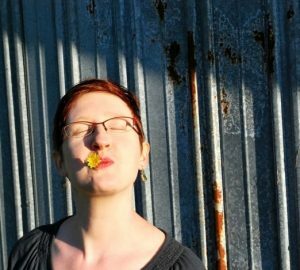 It wasn’t until this year that I began to study its health benefits. Do you drink the tea and feel that it really does have the power to make you feel less depressed, more energetic, reduce stress and aid in the treatment of cancer? I have fibromyalgia. Do you think it would help me? I am not sure what exactly fibromyalgia is ….I know it can be painful…..but another benefit of Jiaogulan is it helps inflammation which is the cause of many diseases. 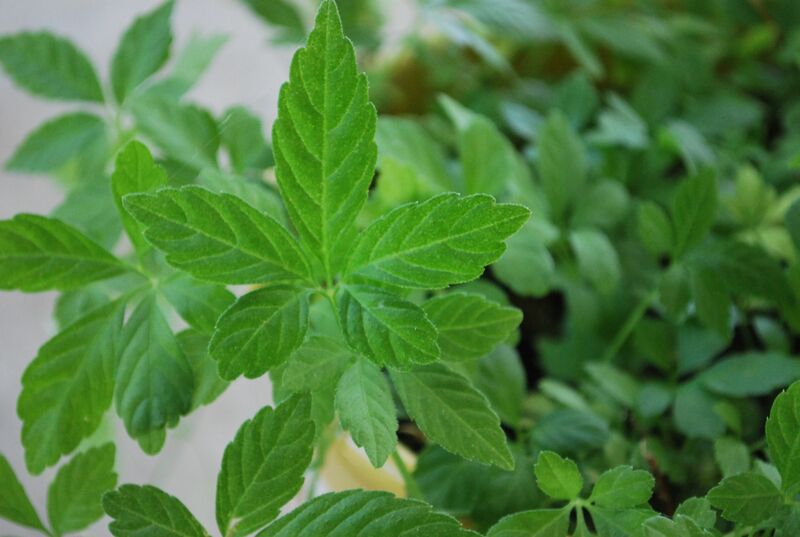 I grow gynostemma indoors.. in UK too cold for outdoor here unless summer months.. Ive noticed insect eggs ( think may be scaly bug) what can i do about it.. as cant use chemicals. Any other infestations that this plant is prone to? I have an adaptogen plant as a house plant will it die back for winter even if it’s inside and if it does will come back in spring. Hi Olivia! Have you tried an organic neem oil pest spray? I’ve had good luck in the garden mixing a little dish soap in water and spritzing my plants with it but haven’t needed to try it with my houseplants yet. Where can I buy this plant? I read about it and it requires both male and female plants. Can it be grown from a piece of cutting? I purchased my plant via mail order from Strictly Medicinal Seeds. As far as propagation goes, I have experimented with dividing it (good success), and with starting from cuttings in water with moderate success – so far it’s been slow going. Then again, I was out of rooting hormone and I’m sure that would speed things up! How long does the plant takes to grow ? From seedling to harvesting ? It took my plant about two months to really settle in on my windowsill and I’m usually able to harvest enough for a cup or two of tea every month. It grows much faster and more prolifically if you are able to plant it out of doors. Good luck!